Police in Sussex are conducting a week-long campaign to target knife crime and address the reasons why young people carry blades. Sussex Police officers are joining colleagues from across the country in an effort to get knives off our streets and educate those most at risk. The campaign is run twice a year and named Operation Sceptre. This week's planned campaign comes at a time when a number of high profile stabbings elsewhere in the country are in the public eye. Assistant Chief Constable Nick May said: “We are keenly aware of how much focus knife crime is getting in the media at the moment. 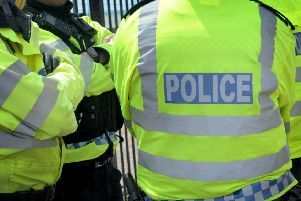 Police will be out on targeted patrols across the county, with officers also working alongside British Transport Police. There is also other planned activity with days of action, working alongside other partners allowing the force to talk about the dangers of knife crime and engage with those at risk of carrying knives. People are encouraged to drop off their dangerous or unwanted knives and blades at police stations across Sussex as part of a knife amnesty. These amnesty bins are in place all year round, and there will be no consequences if weapons are disposed of safely here, according to police. Knife amnesty bins are located at the following stations: Worthing (Chatsworth Road), Shoreham, Chichester, Bognor, Littlehampton, Midhurst, Horsham, Crawley, Eastbourne, Lewes, Seaford, Newhaven, Haywards Heath, Burgess Hill, East Grinstead, Hastings, Bexhill, Battle, Rye, Hailsham, Uckfield, Crowborough, Brighton. Test purchasing will be carried out throughout Sussex, where officers, PCSOs and cadets will mystery shop to see which premises allow them to buy knives without their age being asked for. ACC Nick may added: "Operation Sceptre gives us a chance to talk about knife crime in a realistic and open fashion: we want to give young people the chance to stay safe, we do not want to demonise them. “Talk to the young people in your life, drop off your dangerous and unwanted blades to our knife amnesty bins, and if you need to talk to someone anonymously, Crimestoppers can be reached on 0800 555 111. Sussex police and crime commissioner Katy Bourne said: “Getting killed or ending up with life changing injuries or a prison sentence because of knife crime is not a choice anybody would rationally make, but far too many young people are putting themselves at risk by choosing to carry a knife. “The Operation Sceptre campaign will raise awareness of these dangers and provide opportunities for young people to discuss what might motivate them to carry a knife. “I hope that the recent media coverage of families devastated by knife crime will encourage people to use the amnesty bins across the county and take unnecessary blades off our streets.